This is the first in a series of posts that aim to explain how to move your website up search results, above your competitors. No need to worry. This is all quite easy and many content management systems allow you to do much of it yourself. You might need to contact your web designer for one or two of the trickier bits. If this sounds a lot, just remember the golden rule: you only need to do enough to stay one step ahead of your competitors. Keep checking. Here we’ll explain what an XML sitemap is, how to make one, what to do with it, and the consequences of not having one. The image above shows an example. An XML Sitemap is a page on your website that humans don’t see. Search engines use it to help find all the pages on your website. To look at yours, type your domain name, followed by “/sitemap.xml” into your browser address bar. E.g. go to www.yourdomain.co.uk/sitemap.xml. You should see a file that lists all the pages on your website, wrapped up in some code. The example above has the URLs (web page addresses) in bold. Check to make sure the file contains all your web pages. Yours may be formatted more prettily than this, but that doesn’t make any difference. It may also have other parameters (e.g. <priority>, <lastmod>…) but it’s the URLs you need. Some XML sitemaps contain links to other files, also XML sitemaps. Click the links to see the actual sitemaps. 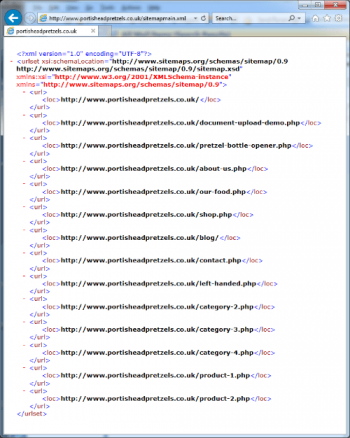 Our CMS testbed, Portishead Pretzels, works that way: one file describes the website, the other our blog. The URLs are bold again. BlueTree CMS, our Content Management System, automatically maintains your sitemap.xml file as you add, delete, or rename pages. Some other CMS’s will maintain it, too. Joomla and WordPress users, for example, can install a plug-in that does the job. Failing that, every time you create, rename or delete a page, create a new sitemap using an online tool like this one. Then upload it to your website’s root directory. Your web designer will submit your XML sitemap to the major search engines when your website goes live. They usually do this as a matter of course. It only takes a few minutes. You don’t usually need to ask, and you probably won’t have to pay extra. Once submitted, your site will be on the search engines’ radar and they’ll keep up with changes you make. Just because you tell them your site exists, doesn’t mean they’ll index all the pages immediately. They will begin to crawl your site. If they think your pages are worth it, they’ll index them. They’ll also follow links in them to other pages and decide about them, too. If you’re not able to fix problems yourself, contact your web designer. They will probably offer to survey your website for not too much money. 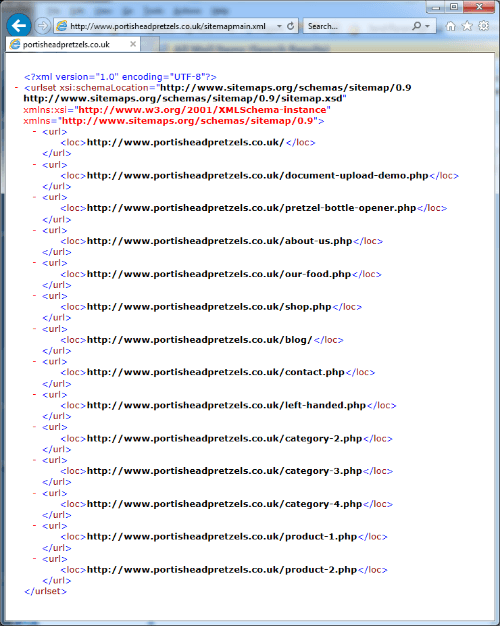 If you have no XML sitemap, it will probably take a while for search engines to realise you have a website at all. The only way they’ll find your site is if they discover a link to it elsewhere on the Internet. However, once they’ve discovered it, they’ll crawl it and, over time, index your (worthy) pages. Later in this series we’ll explore other ways to tell search engines about your site. However, we recommend an up-to-date XML sitemap as your first step in the race to get ahead of your competitors. This entry was posted in Digital Marketing and tagged search results, xml sitemap on October 11, 2017 by Dave Fielden.